Hay House, Inc., 9781401944261, 336pp. Not many people in the medical world are talking about how being afraid can make us sick—but the truth is that fear, left untreated, becomes a serious risk factor for conditions from heart disease to diabetes to cancer. Now Lissa Rankin, M.D., explains why we need to heal ourselves from the fear that puts our health at risk and robs our lives of joy—and shows us how fear can ultimately cure us by opening our eyes to all that needs healing in our lives. 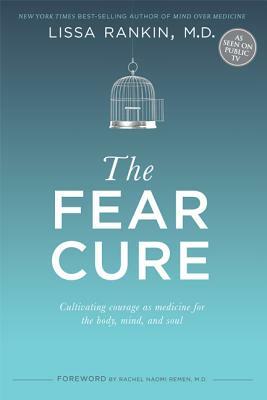 At the intersection of science and spirituality, The Fear Cure identifies the Four Fearful Assumptions that lie at the root of all fears—from the sense that we’re alone in the universe to the belief that we can’t handle losing what we love—and shifts them into Four Courage-Cultivating Truths that pave our way to not only physical well-being, but profound awakening. Using exercises from a wide range of mind-body practices and spiritual traditions, Dr. Rankin teaches us how to map our own courage-cultivating journey, write a personalized Prescription for Courage, and step into a more authentic life. Lissa Rankin, M.D., author of the New York Times bestseller Mind Over Medicine, is a mind-body medicine physician, author, speaker, and founder of the Whole Health Medicine Institute, a training program for physicians and other health-care providers. Passionate about what makes people healthy and what predisposes them to illness, she studies how healers might better care for patients and how patients might better care for themselves. She is on a mission to heal health care, help patients play a more active role in healing themselves, learn from indigenous cultures about anomalous forms of healing, and encourage the health-care industry to embrace and facilitate, rather than resist, such miracles. She is also passionate about how spiritual growth translates into physical healing and how awakening collective consciousness heals us all.